Do you love living life on the fast lane? If you have answered in the affirmative and are not working just yet, chances are you have an affinity for video games that feature fast cars, such as Gran Turismo and Need for Speed – after all, playing those titles are more or less the next best thing when it comes to enjoying super exotic vehicles, considering how it is nearly impossible to own one by working for people. 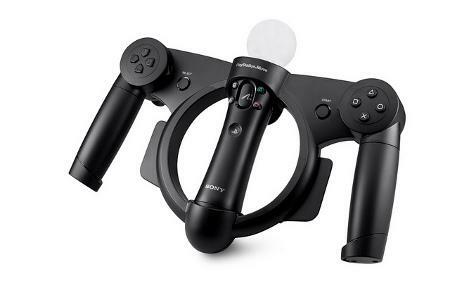 Well, the classic video game controller for any console, including the Sony PS3, was not geared for racing games, which is why the PlayStation Move Racing Wheel was announced at Sony’s E3 press conference today. The PlayStation Move Racing Wheel is a spanking new peripheral for racing game fans who own a PS3, where it will transform your PlayStation Move motion controller into the ultimate racing experience, capable of supporting just about any vehicle that you have chosen to drive. Some of the highlighted features include precise motion tracking for responsive handling of your vehicle, an innovative folding grip design will allow you to switch between racing a sports bike to a high-octane supercar, the ability to feel the intense vibration feedback of your vehicle as you try to muscle your way through a pack of no-quarter-given opponents behind the wheel, while experiencing realistic gameplay action thanks to the inclusion of race car paddle shifters and motorcycle twist throttle controls. I do wonder what other racing game peripheral manufacturers like Logitech thinks about this. The PlayStation Move Racing Wheel does not resemble an actual steering wheel at all, as it is more geared towards an aircraft of sorts, or perhaps the Formula 1 wheel, but any normal car on the road will not feature a “wheel” like the shape it comes in. Ah well, if you cannot wait to get your hands on the PlayStation Move Racing Wheel, be pleased to know that it will arrive later this fall for a relatively affordable $39.99, and it will also support upcoming racing titles such as Little Big Planet Karting. Fret not about backwards compatibility, as it will play nice with PS3 racing favorites such as Gran Turismo 5, Need for Speed: Hot Pursuit, BurnOut Paradise, and MotorStorm Apocalypse, amongst others. Do bear in mind that the PS Move is not included with each purchase, so you have got to own it first before picking up the PlayStation Move Racing Wheel!